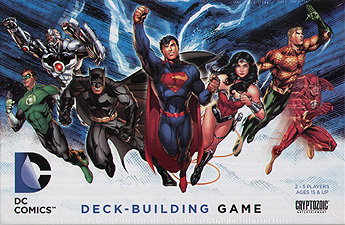 In the DC Comics Deck-Building Game, you take on the role of Batman, Superman, or one of their brave and heroic allies in the struggle against the forces of Super-Villainy! While you begin armed only with basic combat manoeuvres, you will add new, more powerful cards to your deck as you go, with the goal of defeating as many DC Comics Super-Villains as you can. In the end, the player who has accumulated the most Victory Points from the cards in his or her deck wins the game. Card combos, strategy, and fun abound in this game where every card features amazing fan-favourite art. Compatible with other Cerberus Engine: Heroes games, a common card back means you can shuffle your whole collection together for the ultimate throwdown! I was not sure if I was going to like this game, but I was pleasantly surprised. It's a deck building game so starting hand of cards, deal yourself half of them, use the power (in this game) marked on them to "buy" better cards to improve your hand for later turns. In this game there are Supervillans to defeat who are worth more VP's at the end but trigger attacks on all the players, which you may be able to defend with cards in your hand. Neat little game, you each play a character which has particular bonuses which dictate what sort of cards or method of playing you need to adopt. Length of the game can be determined by how many Supervillans you have and I am informed there are numerous variants that can be introduced that shake gameplay up in various ways to make things more interesting. Good fun and would probably play this again.